One hip thrust and he'll blind you, too. Voldo is coming back for Soulcalibur 6. "The Guardian of The Vault, Voldo rises up once again!" teases the video description. "Armed with this signature Katar, Manas & Ayus, he will slash anyone foolish enough to steal his treasures." 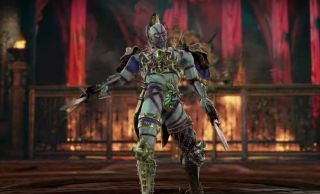 Voldo is the latest in a long line of characters announced for the sixth Soulcalibur game. Also confirmed are Sophitia, Mitsurugi, Nightmare, Xianghua and Kilik, the eye patch-wearing Grøh, and, last but never least, The Witcher's Geralt. Soulcalibur 6 is coming to PC, PlayStation 4, and Xbox One on October 19, 2018.